The two things that will make you a faster tennis racket stringer. Follow these simple tips here. Save some time and effort when stringing your next tennis racket.! Here are the two quick tips. I ran across the following question recently regarding a soft 'weave' / hard 'weave' and about weaving ahead one string. The answer to this is also a way to get faster at stringing - stay tuned for the answer. Question: "What is the difference between a soft weave or a hard weave?" Answer: Generally the terms soft or hard weave pertain to something that occurs during your cross weaving (stringing the cross strings - the ones that go from side to side, the horizontal strings and the ones to get installed after the mainstrings). Racket strings are weaved in between each main string and therefore go in an 'under and over pattern'. When you get one cross string installed the racket stringer will generally pull the string with the machine, clamp it to keep it secure and then will weave the next one. Every other string will generally be easier to install if the previous string has not been tightened and this is where weaving one string ahead comes in play. The idea is to make the cross string installation easier for yourself with less friction and if you weave one string ahead it will be easier to install the cross strings. Give it a try and see if you have an easier time and can feel which string is the soft weave and hard weave. STRINGING FASTER TIP 1: Pre-weave one cross string ahead before you pull- this reduces friction and makes weaving easier and quicker. STRINGING FASTER TIP 2: Pre-weave the main strings! yes pre-weave all the mains in the racket before starting crosses. I have gotten mixed reviews on this from previous articles on the topic and I think mostly because change takes time. If you try it once It will most likely be harder at first until it becomes a habit. When I started stringing professionally at tournaments I think I was the only one not pre-weaving the mains and I sort of refused at first to adjust my stringing, somewhat stubborn attitude or just for the fact that it can be somewhat confusing at first having all the strings just sitting there loose. The short of it is this: Imagine you get the string in your hand, quickly install the main strings, you quickly know if you have enough for the short side (on one piece stringing) and know if the tie off is at the top or bottom to help you determine if you are going to be stringing traditional or around-the-world (you can read my blog on this if it is not clear). You then start pulling strings, clamping, pulling without having to find the end of the string weave it in and pull and clamp than finding the end of string again and weaving then pulling ext. I honestly can't imagine stringing rackets without pre-weaving the mains. One exception to this rule for me is the Prince O rackets because the strings are not secured by grommets and it makes it somewhat harder so I leave them out of this equation. I hope this made sense. Please remember it takes some time for this to become a habit, at first it may not seem like it is better or quicker but once it becomes a habit you will start to see the difference. Although an easy concept it becomes more difficult when trying to explain in a blog post. I hope to have some video posts up soon that will explain some of these concepts. If you find this site useful, please share it, if you have questions please comment and if you need some more tips. 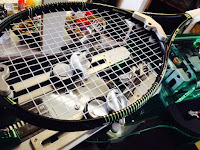 Check out my 25 racket stringing tips.